Update: This post seems to get a lot of traffic, especially around the holidays. 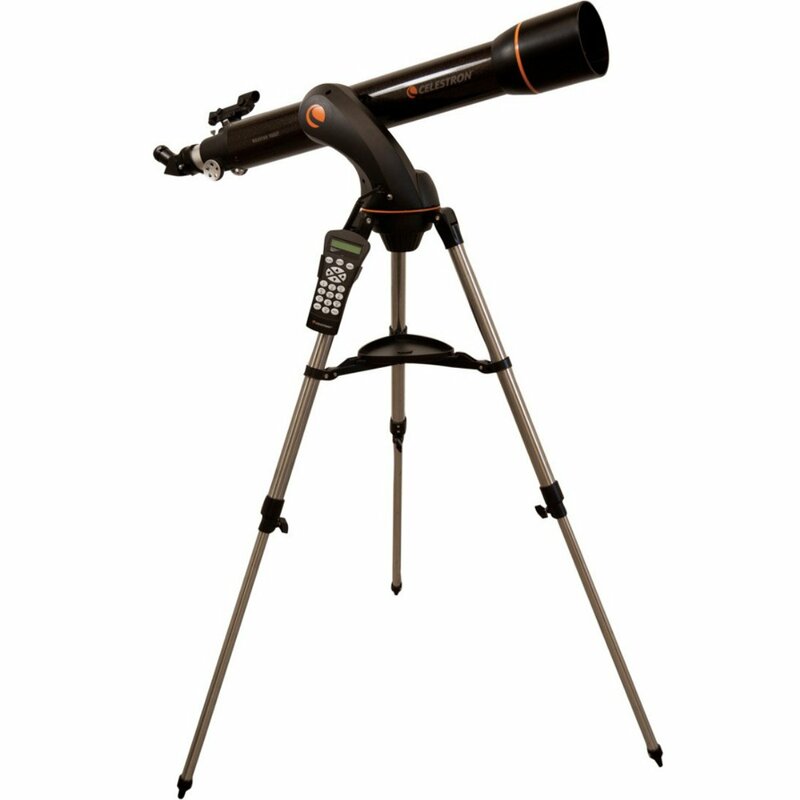 If you’re looking for good gifts for amateur astronomers, including telescopes and binoculars that won’t break the bank, you may also be interested in myastronomical wish list for beginning stargazers. Last year I picked up a Celestron Travel Scope 70 , mostly because it was cheap (~$65) and I was curious. 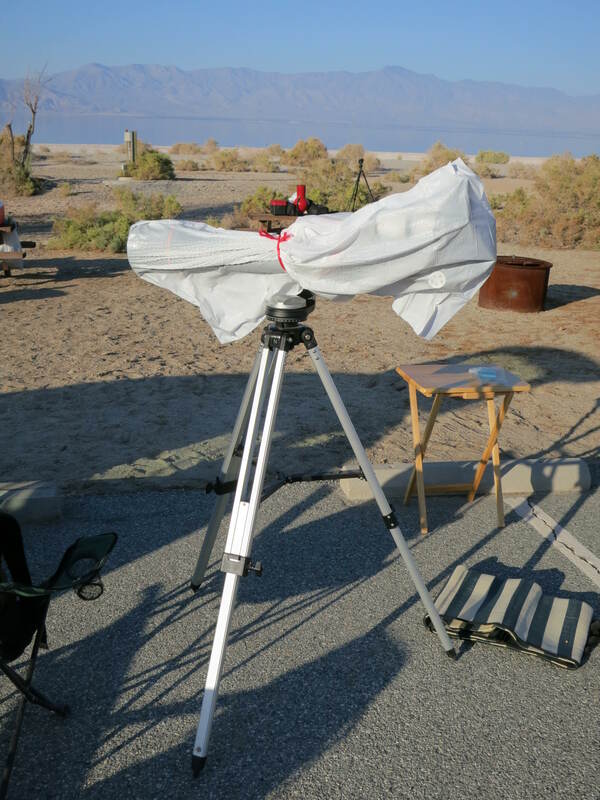 Except for a couple of quick peeks with the scope, the only serious workouts it got were the transit of Venus and an all-nighter on Mount Baldy. My feelings at the time–explained here–were that the scope was great a low-power scanning but useless at anything over 50x. 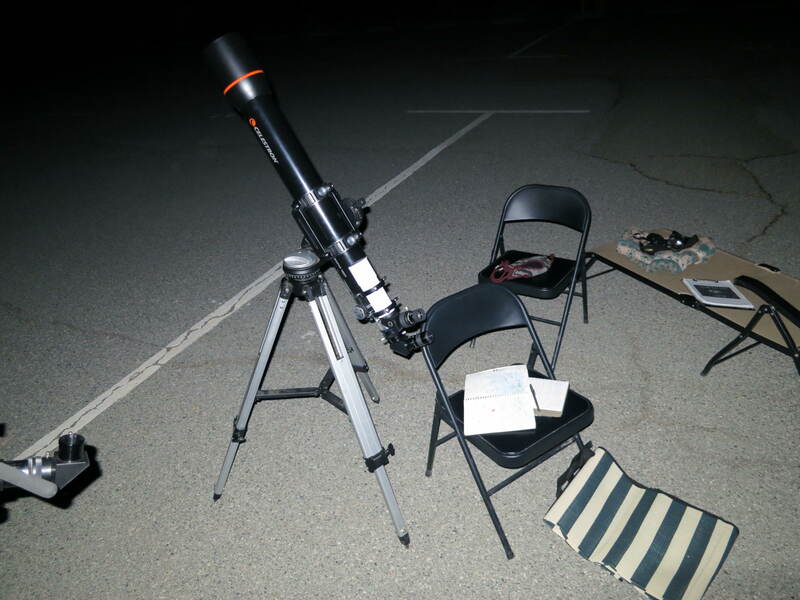 Terry Nakazono suspected it was miscollimated, but I’d never collimated a refractor and I had plenty of other stuff to be getting on with, so I let the TS70 languish. 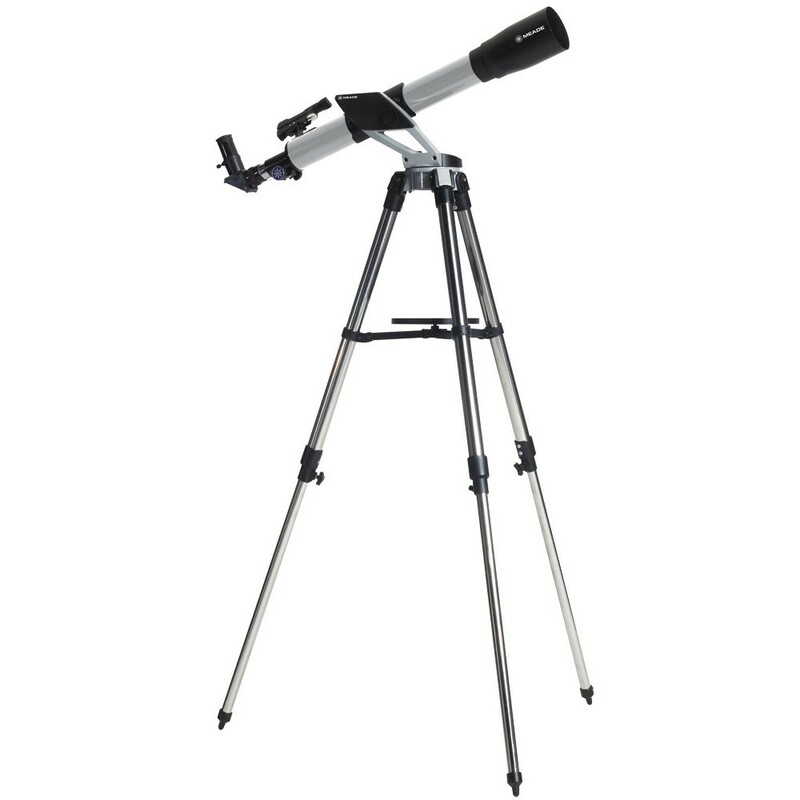 This fall, London has been showing more interest in astronomy and I let him have the TS70 as a hopefully more user-friendly alternative to the Astroscan, which is a cool scope but can be a real PITA to get on target with. The first problem is that although the TS70 has an actual dovetail bar, it is so ludicrously short and so far forward on the tube that it is almost impossible to balance the scope. For reasons that escape me at the moment, I have several spare dovetail bars lying around, so I grabbed the next larger one to put on the TS70. But there’s a problem: the bolts that hold the ludicrously short dovetail (LSD henceforth) on the scope are threaded into nuts inside the tube. You can see those nuts and bolts at the bottom of the tube in the middle distance in the above photo. But you can only see them because I had to remove the objective lens to get this picture. 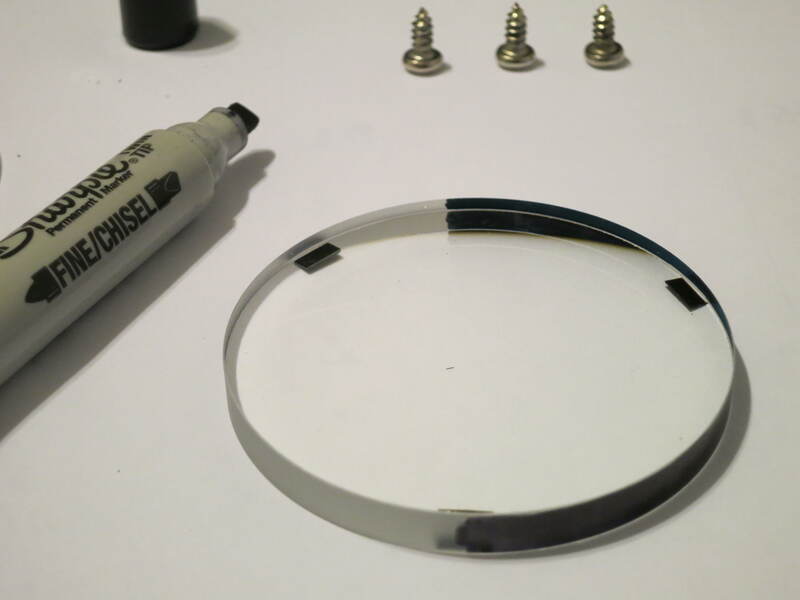 the dust cap (with solar film) for the objective lens, with the dew shield inside. The dew shield slides off, and the retaining ring for the objective lens simply unscrews. There’s nothing else holding the two components of the objective lens in; once the retaining ring is off you can simply tilt the tube down and let them fall out–onto something soft (so they don’t get scratched), that isn’t your hand (so they don’t get smudged with oils). The focuser is held into the tube with the three screws, and the LSD is held on with the two bolts and their nuts. So there are really only five fasteners holding the scope together, or six if you count the objective lens retaining ring. So, about that objective lens. This is an achromatic doublet, meaning that it has two pieces of glass of different compositions (the ‘crown’ and the ‘flint’), to bring more than one color of light to focus at once. In the above photo, the crown is on the left and the flint is on the right. They are different colors, but I’m not sure if that’s because of different light transmission or different coatings. Note the three little foil spacers on the flint, which keep the two lenses at the proper distance. 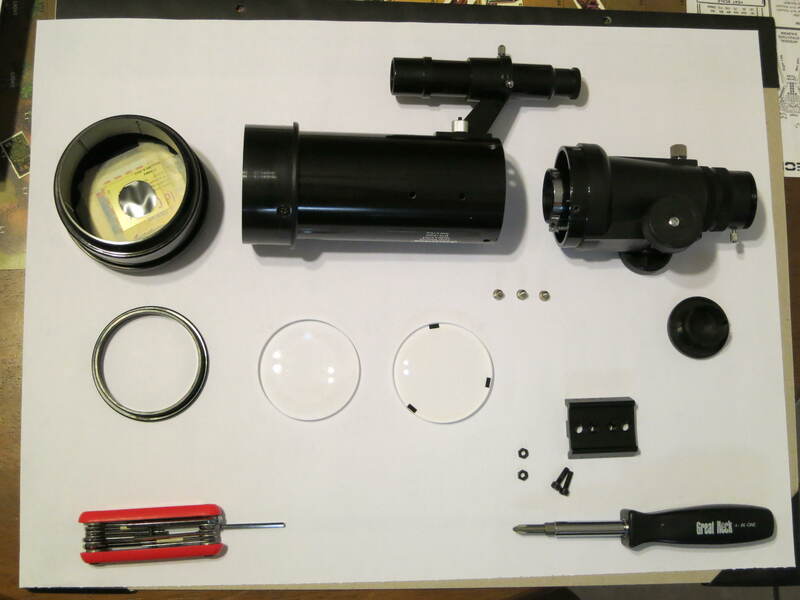 IF you ever disassemble a multi-element lens, it is extremely important that you keep the parts not only in the right order, but also facing the right way, or you are going to waste a lot of time trying different arrangements (and risking damage to the glass) until you discover how they go together. Better to just keep track of them as they come out. 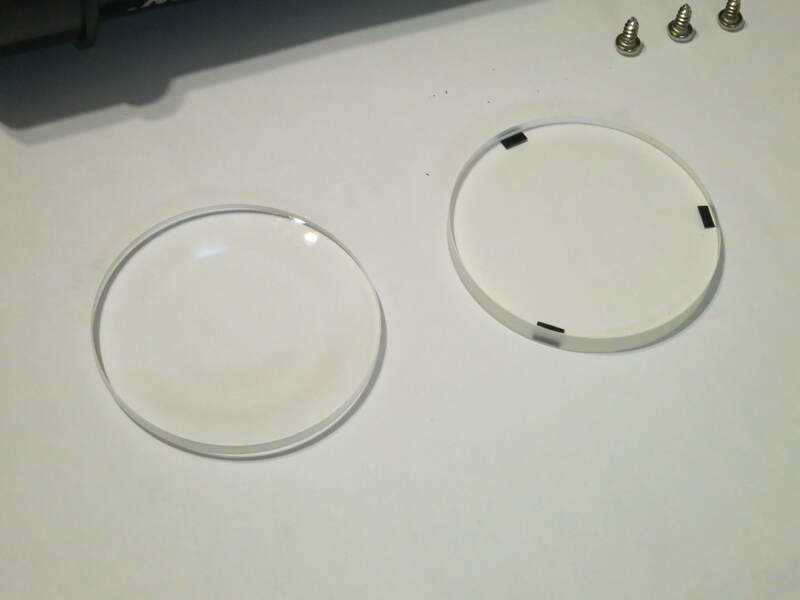 Next item: unless their edges are blackened, lenses suffer from internal reflections, which cause reduced contrast at the eyepiece. Lots of cheap scopes and eyepieces have un-blackened lens edges, so whenever I take something apart, I blacken the edges. I use a sharpie, two coats, but I’m sure there are other ways. Aaanyway, the retaining ring for the objective lens is almost always too tight when the scope ships from the factory, and simply unscrewing the ring and gently shaking the tube to settle the lenses is often enough to improve collimation. And that’s all I did here. The scope starts to pant around 40x and anything north of 60x is just bad…. Trying to achieve focus on planets is maddening. Jupiter goes from a vertical fan of red light on one side of focus to a horizontal fan of blue light on the other, and only sort of flirts with being a clean disk in between those extremes, at an infinitesimally tiny point that the rack-and-pinion focuser tends to shoot right past. 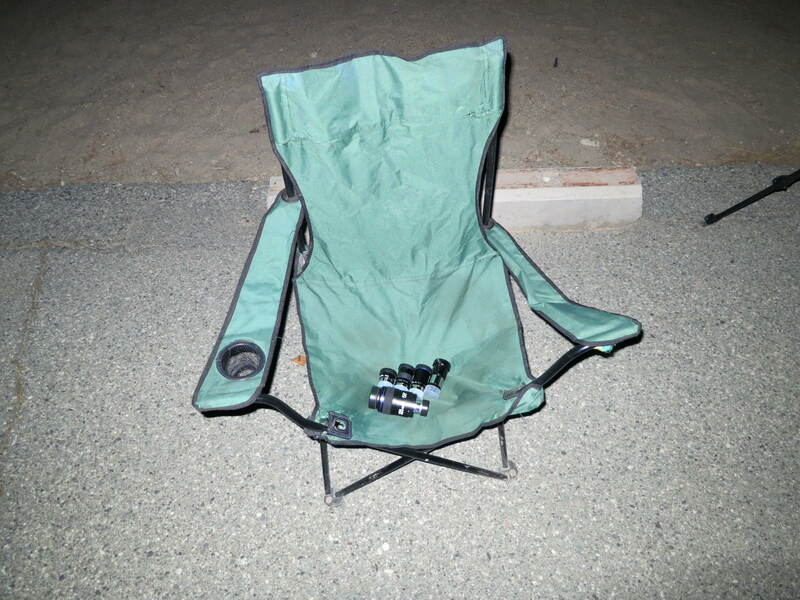 But Saturday night out at the Salton Sea, the reassembled Travel Scope 70 was like a brand new scope. Images were still pretty crisp at 67x with a 6mm Orion Expanse, and going up to 133x with a Barlow did not just add empty magnification. Here are my observations on different objects. There was a time, not terribly long ago, when splitting Polaris was said to be a good test for a three inch scope. In today’s brave new apochromatic world, however, splitting Polaris is something of a joke. Polaris is easy. The double-double is easy. That’s cool, but the TS70 is not an apochromat (a three-lens-element scope with better control of false color and therefore usually sharper optics than an achromat), nor is it a three-inch scope (2.75″ to be exact). So the fact that Polaris was cleanly split at relatively low magnification (67x) has to be a win. 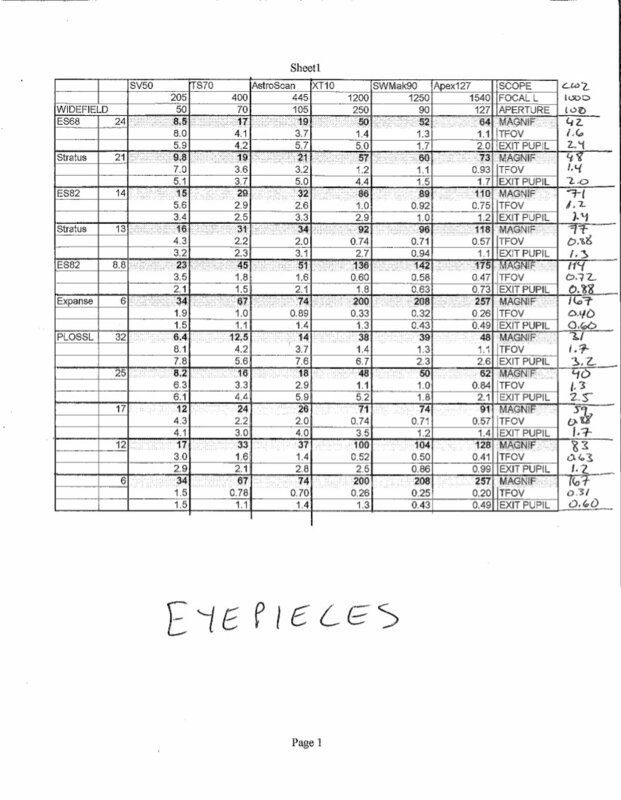 the more pronounced brightness difference between the ε1 components (magnitudes 4.7 and 6.2) compared to the ε2 components (5.1 and 5.5), although not normally a factor, might have made that one a tougher split since I was working at the hairy edge of what the scope and the conditions would support. Anyway, since the closer pair of the double-double was cleanly split even under the less-than-perfect conditions Saturday night, I feel confident saying that this scope will split the double-double. 1:50 AM. Jupiter in TS70 with 25mm Plossl (16x), just a bright spot. In 12mm Plossl (33x), a disk with two bands. In 6mm Expanse (67x), hints of more than 2 belts during moments of steady seeing, but bad seeing easily visible in image–Jupiter looks like it is on fire. Barlowed 6mm Expanse (133x): this is too much mag. No new detail, and previously seen belts and zones are harder to make out. 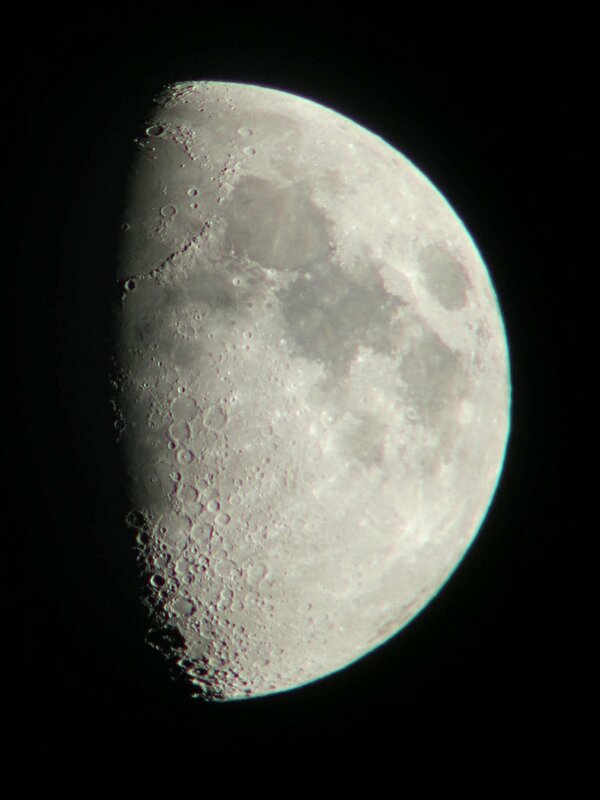 No problem focusing using moons, though–I think problems are seeing, not scope. 3:57 AM. TS70 to Jupiter, in 6mm Expanse (67x, definitely more than 2 belts/zones showing now that Jupiter is higher in the sky. Planet is still visibly “burning” in the bad seeing. Three to four belts visible, meaning at least two different belts in addition to the bold equatorial belts, but hard to hold both extra belts at one. Mars was a visible disk in 6mm Expanse, but swimming in the near-horizon murk near Regulus. M81 and M82 easily visible in 25mm Plossl (16x), showing some detail in 12mm Plossl (33x). M31, M32, and M110 visible in one field with 12mm Plossl (33x). 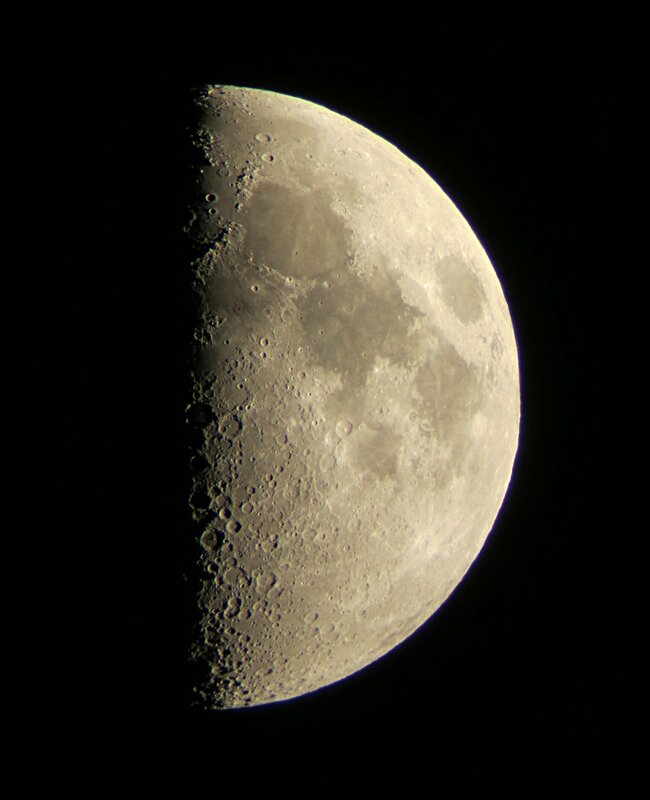 I spent some time on the moon, and snapped the photo above using a Canon S100 point-and-shoot and a 25mm Plossl. I flip-flopped it left-to-right and lightly sharpened it in GIMP, but didn’t mess with the brightness or color. 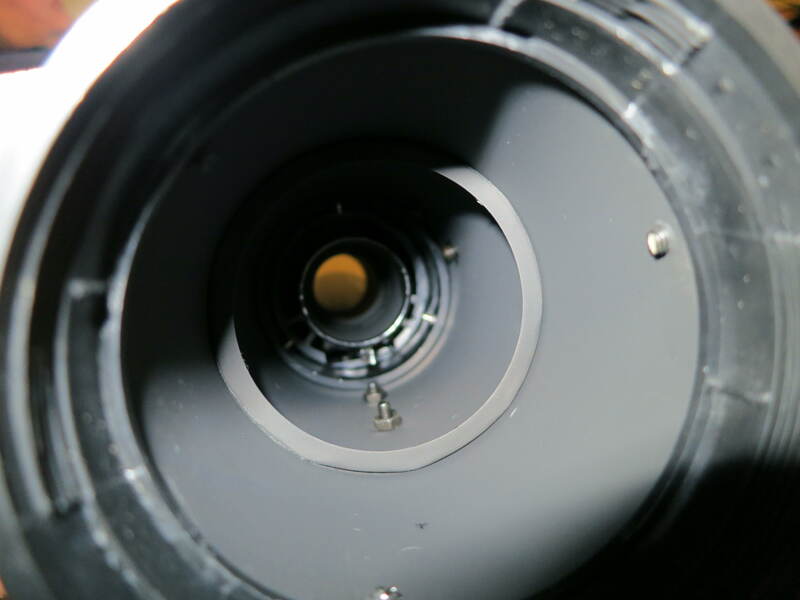 It’s not an amazing image–a 90mm Mak will thoroughly spank this scope (proof)–but it’s not bad. as supplied, my scope had two major problems: the LSD, which all TS70s ought to share, and badly miscollimated optics on this sample, which were easy enough to fix by completely disassembling the telescope and voiding the waranty. Also, focus is still a hairy procedure at high powers, and it is easy to overshoot best focus. 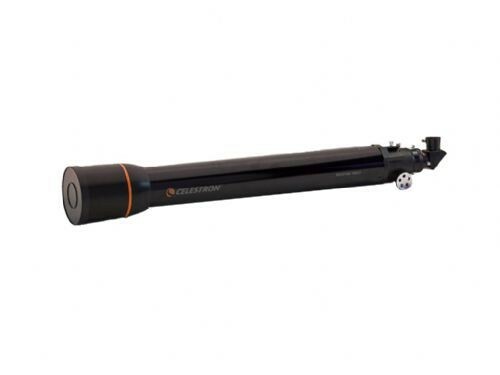 However, if you’re willing to buy or build a new mount and put in a little elbow grease, there is a surprisingly capable scope lurking inside this unassuming package–one that is capable of doing useful work on the observing field. Even with mostly plastic, jokey accessories, this scope is still a decent deal, although I shudder to think about the many unfortunate users who try to use the scope on the supplied tripod. I note that according to the commonly-used “50x per inch of aperture” rule of thumb for max magnification, a 2.75-inch scope ought to be good up to 138x, which is pretty darned close to what I was working at (133x). So to be fair all I have established here is that the scope is adequate, according to one widely-used and fairly conservative guideline. 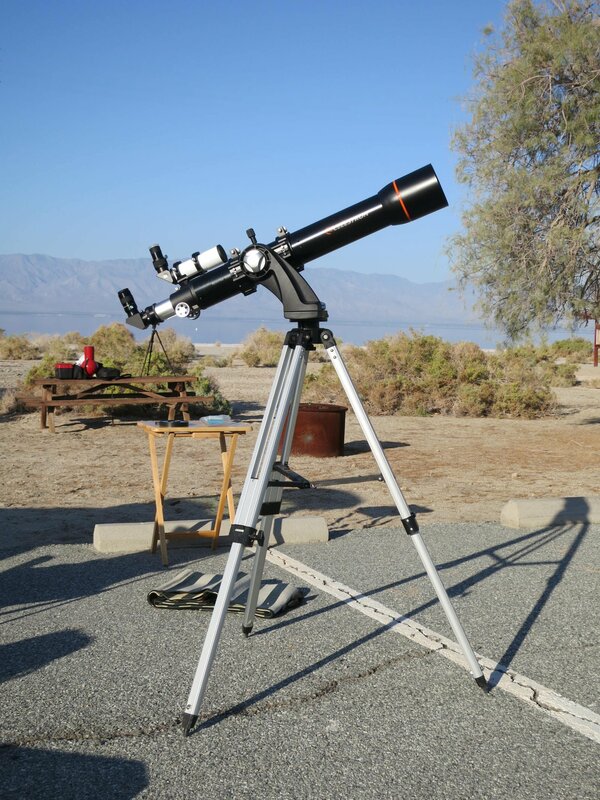 But it’s so much better now than it was last summer–an actual observing tool, not just a toy. And that’s a win. 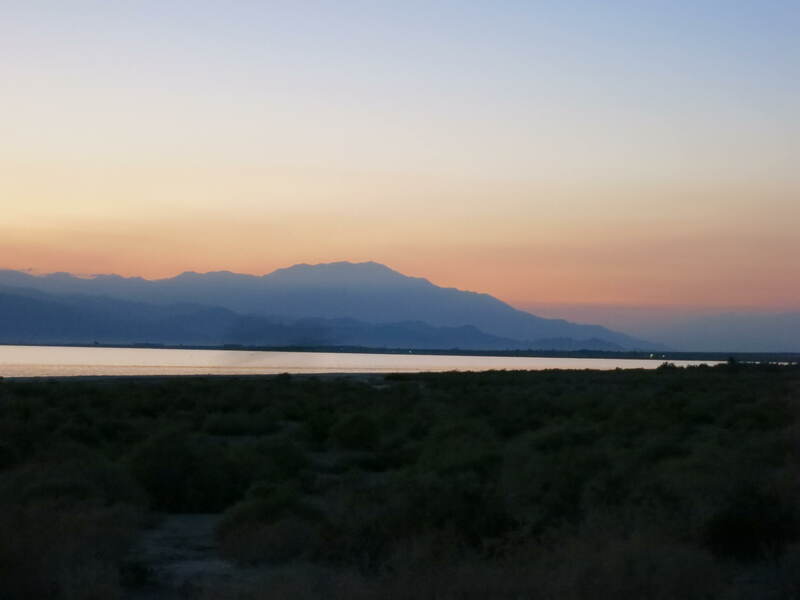 London and I were back at the Salton Sea this past Saturday night (Oct. 12-13). It was our first time there since my accidental Messier Marathon back in March. 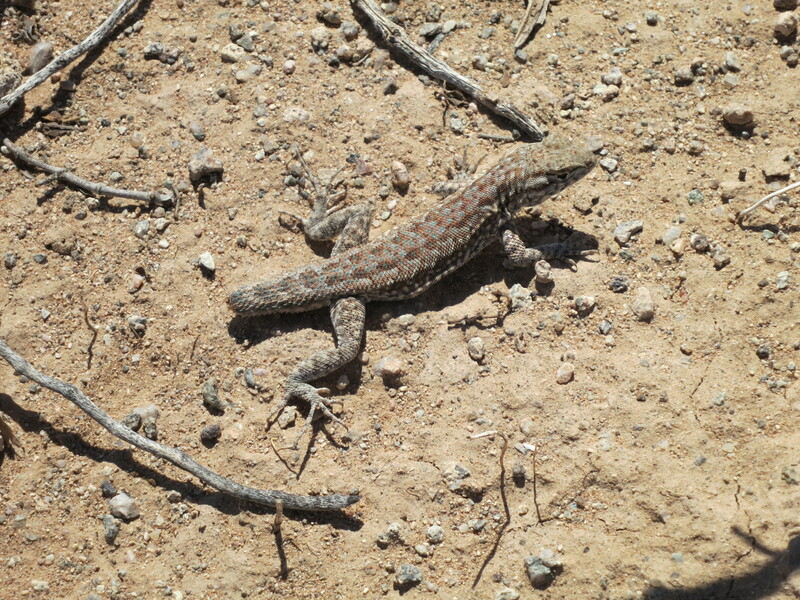 In between times it has been too darned hot to go camping in the desert. It was good to be back. The big news was that I was rolling with a new scope: a Celestron C102 f/10 achromatic refractor, one of the “screaming deal” scopes from this post. I put it on the SkyWatcher AZ4 (= Orion VersaGo II ) alt-az mount where my Apex 127 Mak usually rides. The included dovetail on this scope is too small and too far forward to balance well with an optical finder and heavy eyepieces, so I sprung for the Explore Scientific tube rings and dovetail kit. That was a pretty darned good deal; tube rings alone for a 4-inch scope run $30-40, and a decent-length dovetail is another $15-20, but the ES kit has both for $45, plus a very convenient carry handle opposite the dovetail bar. With the rings in place I could mount my StellarVue SV50 as a finder, and I was ready to go. I also brought along the Apex 127 in case I felt like a change of pace, and because it takes up almost no room (which is one of the reasons I got it in the first place). But I was having too much fun with the C102 and the Apex 127 never made it out of the case. At some point I’ll have to do a detailed comparo between the two scopes, but Saturday night I was just out to have a good time. We also had along the Celestron Travel Scope 70, which London is using in the photo above. I had completely disassembled and reassembled that scope, and after London went to bed at 10:00 I divided my time about equally between the C102 and TS70. Partly I wanted to put both scopes through their paces, and partly I just wanted to hop around the sky, checking in on friends new and old. I will have to do a full-on review of the C102 at some point. For now, suffice it to say that it is a very nice scope. Image brightness and contrast are both excellent; for someone who has spent most of his time observing with reflectors and catadioptrics, this does not feel like a 4-inch scope. On most objects I could have been fooled into thinking I was looking through a 5- or even 6-inch mirror scope. Grain of salt: I didn’t actually go back and forth between this scope and 5- or 6-inch mirror scope, although I plan to do that in the future. I’m just saying that as someone who has spent a lot of time looking through smallish Newts and Maks, this scope felt like it punched above its weight. I was worried that I would feel like I was missing out by taking such a small scope as my main instrument. But I was having so much fun with it that I stayed up nearly to dawn–there were always two or three more things I wanted to check out. The photo above is not from Saturday night but from my driveway on Friday night, when the moon was exactly at first quarter. I flip-flopped it left to right and lightly sharpened it in GIMP, but didn’t fiddle with the brightness or color. There is some false color, most notably along the limb of the moon and on bright planets like Jupiter, but I didn’t find it objectionable. YMMV. I think this is my new favorite moon scope. The image is so contrasty, details just pop. I would put in the 6mm Expanse (167x), watch the moon drift across the field of view, and pretend I was an astronaut. I also sketched a really nice catena (crater chain) in the northeast quadrant of the crater Deslandres. You can see it on the right in this LPOD image, opposite the smaller crater Hell that sits in the western part of Deslandres. If this catena has a name, I haven’t discovered it yet; feel free to enlighten me in the comments. The moon set precisely at 1:00 AM. As you can see from the above composite, the seeing was not fantastic, especially near the horizon. Stars were visibly twinkling below about 45 degrees elevation. After the moon set, it was like a whole new sky. The Milky way fairly blazed, and the sky was so full of bright stars that it was almost overwhelming. I was about as happy as I have ever been. 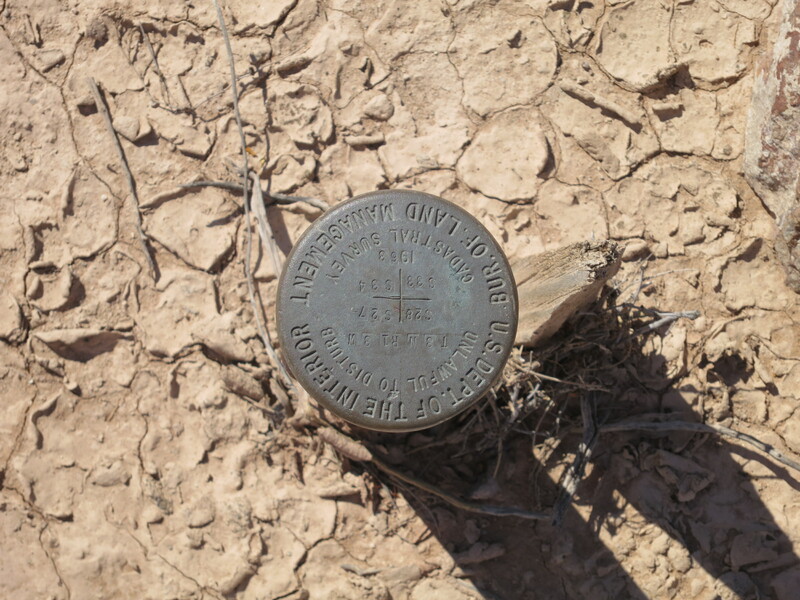 I spent some time observing near the zenith. This can be a pain with a long-tube scope like the C102. You can extend the tripod legs to put the eyepiece at a convenient height, but then you’re futzing with tripod legs all night long, which I loathe doing (another reason I got the Apex 127 was that I can go from horizon to zenith at one tripod setting). I remembered David DeLano saying that he often sits on the ground to observe at high angles, and that led to some experimentation. I found that my range of comfortable sitting eyepiece heights overlaps with my comfortable kneeling eyepiece heights, so I put out a camp pad for my knees and a folding chair for my elbows and voila. Someday I will build or buy an adjustable observing chair, but until then, this will do. I have a couple collapsible camp chairs. They are great for stashing eyepieces when I’m really rolling, because I don’t have to worry about them falling over and rolling off onto the ground like I would with a table. I keep my eyepiece case on a picnic table, well back from the edge, so there’s no real opportunity to knock it over. Now that I have some nice Explore Scientific widefields, I have become a bit of an eyepiece snob. Early in the evening I was sharing views with London and people from a nearby campsite so I started with my “second string” of Orion Stratuses and Plossls, just in case. Sound like a jerk move? Just wait until some kid–or a grown-up relative, in my case–says, “Hey, do I look here?”, and stabs the eye lens of your favorite eyepiece with a greasy fingertip. 6mm Expanse (167x, 0.40 degrees). You would think that the Stratuses would put the 25mm and 12mm Plossls out of business, since they give basically the same or better magnification and a bigger true field. But the Stratuses are quite a bit heavier than the Plossls and required rebalancing the scope. So I was either in Stratus mode or Plossl-and-Expanse mode, and over the course of the evening, the cheap eyepieces won out in terms of convenience. Also, frankly, f/10 is a pretty forgiving focal ratio. With a light cone that shallow, practically any eyepiece is going to do well. The only reason to prefer widefields is for their actual wide fields, and not to help control aberrations from the scope itself. I did note that the difference in apparent field of view was immediately obvious when I bounced from the 52-degree Plossls to the 68-degree Stratuses. Oddly, I never noticed it with the 6mm Expanse (66 degrees), but I think that’s because I only used the Expanse to power up on the moon, planets, and double stars, where I was always fixated on whatever was at the center of the field. Nicely framed, mesmerizingly beautiful. 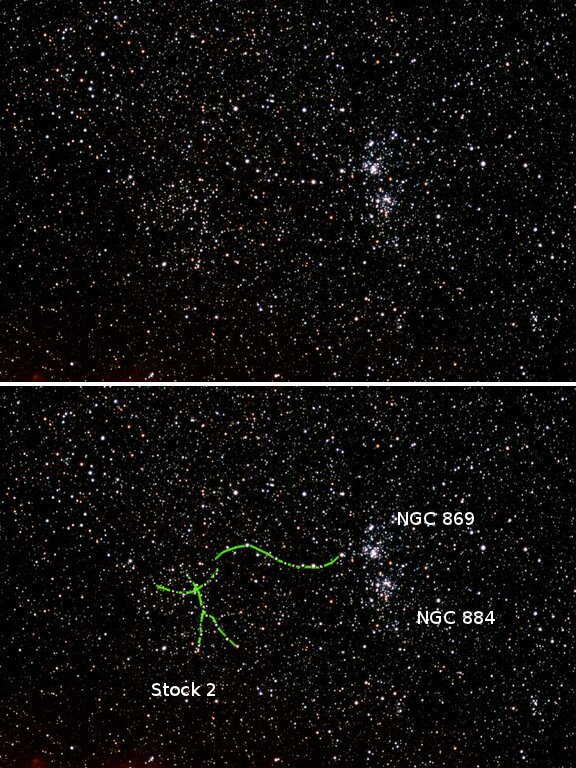 I see at least two red stars in more easterly cluster, NGC 884. NGC 869 is at end of chain to Stock 2. All at 31x. I still do plan to get into astronomical sketching, and when I do, I reckon the Double Cluster will be one of my first targets, if not my very first. With 32mm Plossl (31x), all three galaxies fit in field, with dust lane popping in and out in averted vision. I should mention that M31 itself was too big to fit into the field of view of my lowest-power eyepiece; with the core of the galaxy centered in the field, the edges of the spiral arms went out of the field in both directions. M31 is so darned big that unless you have an instrument with a 3-degree true field, you just can’t see all of it at once. Corollary: if you can fit the galaxy into a smaller field of view, then you’re not seeing all of it, which is sadly the case under even moderate light pollution. The core will punch through even vile city lights, but the spiral arms just die out. Bands not quite lined up with moons. NEB [North Equatorial Belt] seems narrower and better defined than SEB. Several distinct belts to north, single broad ?temperate belt to south. Max detail at this mag–at 187x, seeing is too mushy. I stopped about 5:10 for a biology break. Walking back to the telescope, I was stopped in my tracks by what seemed to be a second Milky Way: a broad band of light stabbing up from the eastern horizon, past Mars and the Beehive (M44) and reaching almost to Jupiter, which was by then high in the sky. It took me a minute to realize that this was the zodiacal light: the cumulative effect of sunlight reflecting off of countless grains of dust in the ecliptic plane of the solar system. The name “zodiacal light” comes from the fact that this light is always found along the zodiacal path traced by the sun, moon, and planets, as it must be, since almost everything in the solar system orbits in roughly the same ecliptic plane (comets excepted–they can come in from any angle, and the fact that they do so was one of the first clues to the existence of the Oort Cloud). 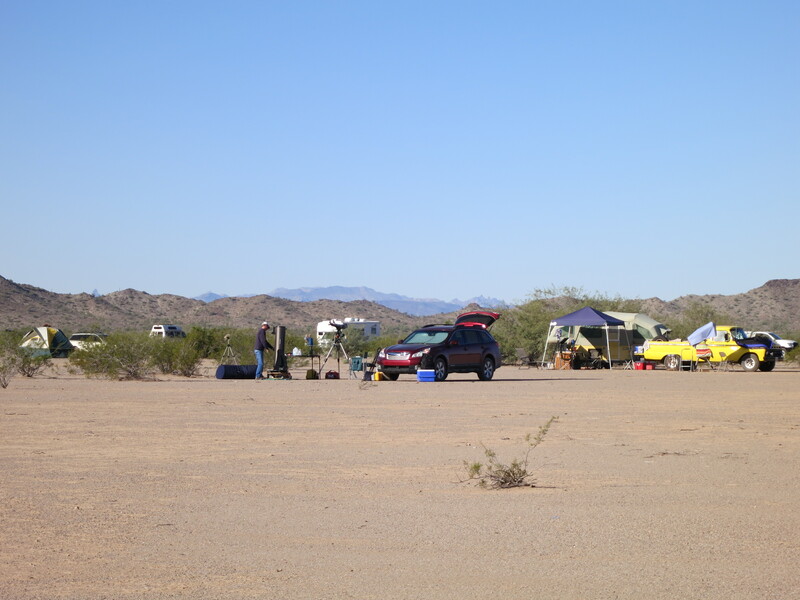 The Gegenschein, which I saw at the 2010 All-Arizona Star Party, is another manifestation of the same phenomenon. Basically, the Gegenschein comes from “full” dust grains exactly opposite the sun in the sky, and the zodiacal light comes from “crescent” or “gibbous” dust grains at other angles. Apparently under the very darkest skies, the Gegenschein can be seen as a bright patch in an arc of zodiacal light that stretches overhead from horizon to horizon. I have not seen that, but it’s on my bucket list. Anyway, given how bright the zodiacal light was Sunday morning, I think I must have seen it many times before and simply not recognized it. I will keep my eyes peeled in the future. Anytime I’ve got more than one bright galaxy in the eyepiece, I’m a happy man. These two were nicely framed in the 32mm Plossl (31x). Using the 12mm Plossl (83x), the gravitationally-tortured M82 showed some hints of detail in averted vision. Probably my favorite pair of Messier objects. M97, the Owl Nebula, is a planetary nebula, a single dying star, about 2000 light years from Earth–right next door, cosmically speaking. M108 is a spiral galaxy in the Ursa Major galaxy cluster, about 46 million light years away, roughly the same size as the Milky Way and containing perhaps half a trillion stars. So one of these things is 23,000 times farther than the other one, and several hundred billion times more massive. If M97 was a ping-pong ball held at arms length, M108 would be a frisbee half a mile wide, located 8.5 miles away. 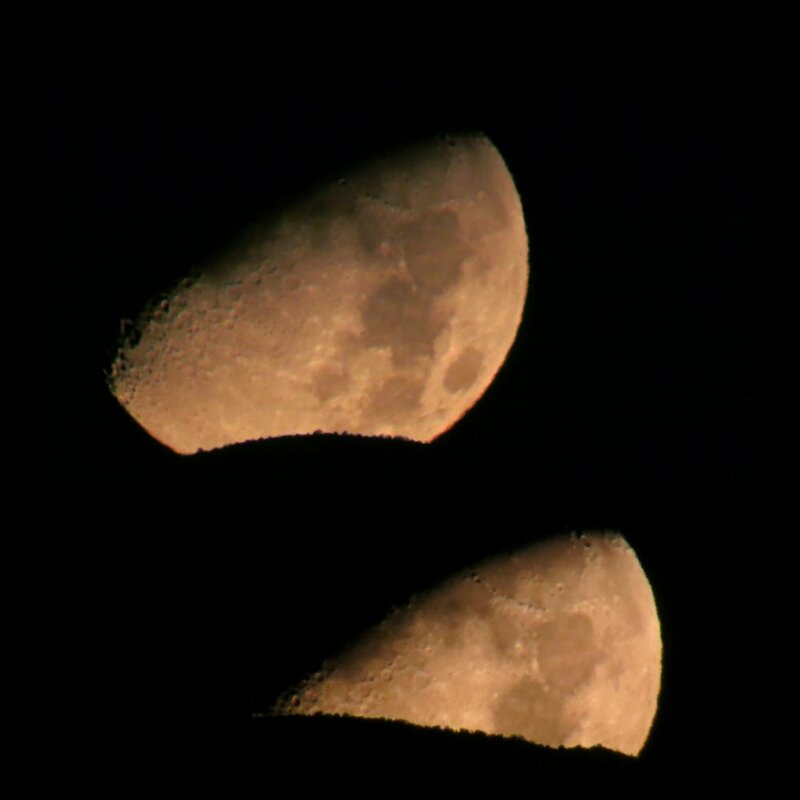 But they look about the same in the telescope in terms of size and brightness, and you can frame them in the same low-power field of view, as I did at 5:27 AM on Sunday. After visiting M97 and M108, I had a quick peek at Mars. The red planet is very distant right now, on the opposite side of the sun from us, but it was visibly a disk and not just a point even at low magnification. The disk was most clear at 83x in the 12mm Plossl, but the planet was just flaming in the lousy seeing and I couldn’t make out any details. Speaking of Mars, our rover Opportunity landed in January, 2004, and is therefore more than nine-and-a-half years into its 90-day mission. Not bad. After Mars I briefly revisited the Double Cluster, but I could tell that my eyes and brain were no longer operating at anything like peak capacity. So I closed everything down and got a couple of hours of rack. The photo above shows my super-fancy telescope protection system. There are dedicated protective covers for telescopes that will work in rain, sleet, and hail, but hell, if conditions get that bad I will pull the scope inside the car. I didn’t just pack it up because I wanted to do a little birding with it in the morning. We did spend some time birding, and then while London got the campfire going, I started packing up. 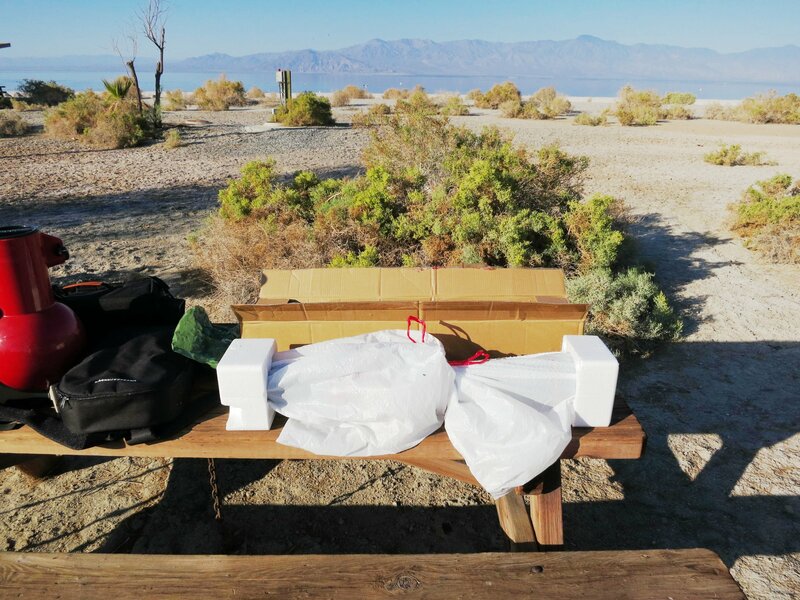 I do have a nice padded case for the telescope en route from Amazon–this one , recommended by David DeLano–but it’s not here yet so I used the trash bags and the packing materials the scope came in. 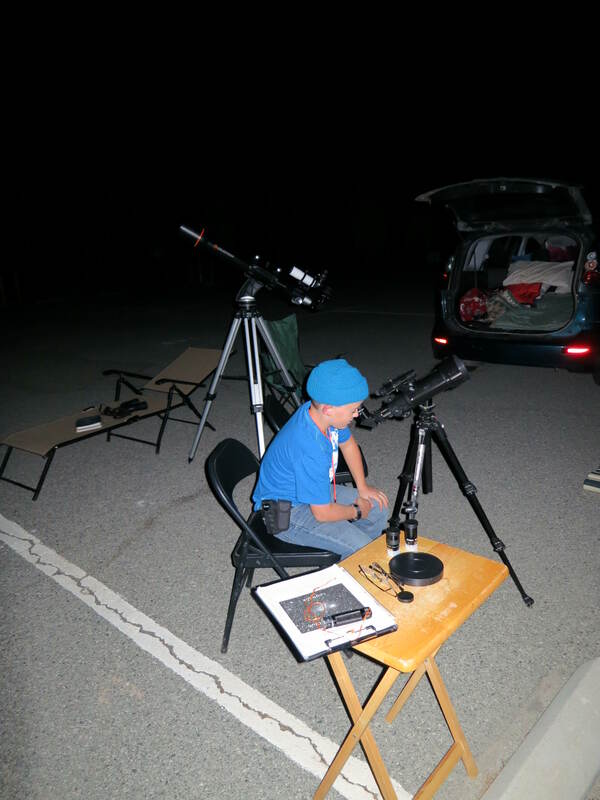 London stayed busy with the Travel Scope 70, which had gotten a workout overnight on the moon, Jupiter, and the deep sky. I have another post coming about the reborn TS70–stay tuned. 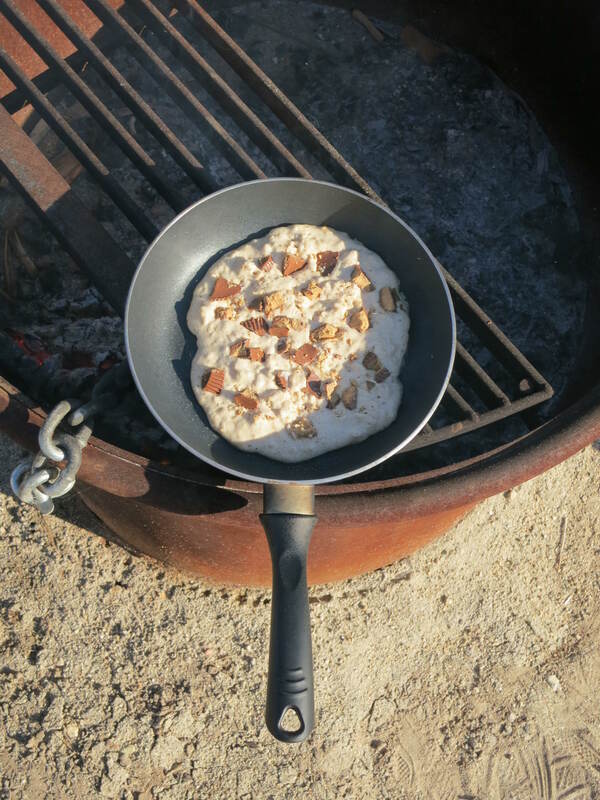 One last thing: Reese’s peanut butter cups make fantastic s’mores, and if you have any left over, they are great in pancakes, too. For various complicated reasons, I had to take a cab home from work tonight. The cabbie mentioned that we were supposed to get rain soon. 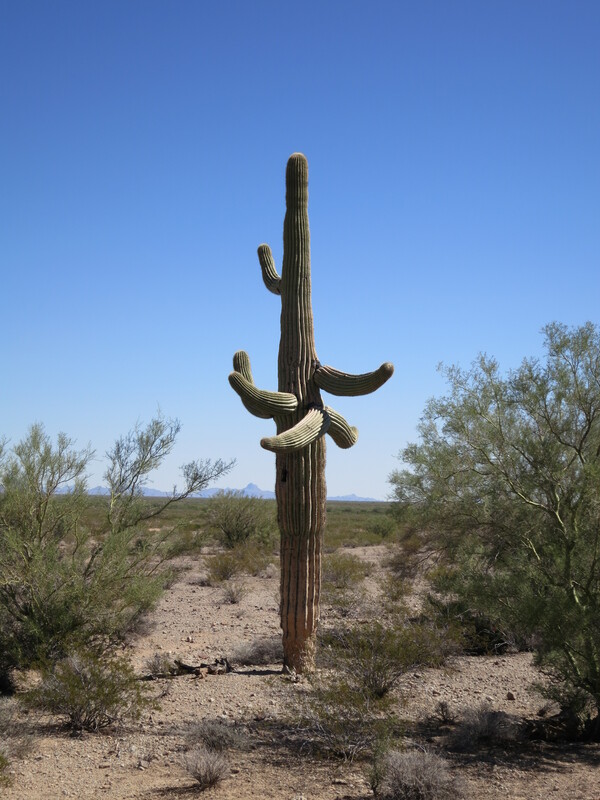 I took this as good news: even the cacti in my front flowerbed are looking a bit peakid, and the SoCal skies are always cleaner and more transparent after a rain. I asked when the rain was due, and he said maybe as early as tonight. That is not fantastic news, because I had hoped to watch Algol go through its minimum tonight and thus check off the 100th item on the AL Urban Observing Club. When I got home, I learned why the rain is coming in tonight. A long skinny box from Oceanside Photo & Telescope was waiting for me. In other words, the New Scope Curse has struck again. So if you’re a SoCal stargazer and you’re wondering why, after a fortnight of clear skies, we’re having rain: I’m the jerk. I have some catching up to do here, but not a ton. Basically since March I have been out of stargazing, except for a quick peek or outreach here and there. In addition to teaching, which goes on every year, I’ve been shepherding a record number of papers (for me) through the publication process, writing a book, and gearing up for my tenure application. To be honest, it hasn’t been super fun. Like Bilbo, I feel thin, like jam scraped over too much toast. The lack of stargazing is just a symptom of that larger problem. But things are looking up, metaphorically and literally. I will be in the anatomy lab until the last week of this month, but I have given my last lecture and written my last exam question for this year. My tenure application is almost done, and so is the book, which is good, since the former is a little past due and the latter is due at the end of this month. And I have rediscovered something that I had forgotten for too long, which is that stargazing is therapy for me. In the middle of town, it puts me in touch with nature; in a career that keeps me on the computer for most of the day, it gets me off the grid (even if only by twenty feet); amidst the crowds and busyness of life it is a little space in which to be alone and at peace. I need to remember that, at least for me, a telescope is a device for seeing farther both inwardly and out. I will have more to say soon about my return to stargazing and the contents of that preciptation-precipitating box. For now, I am just glad to be back. 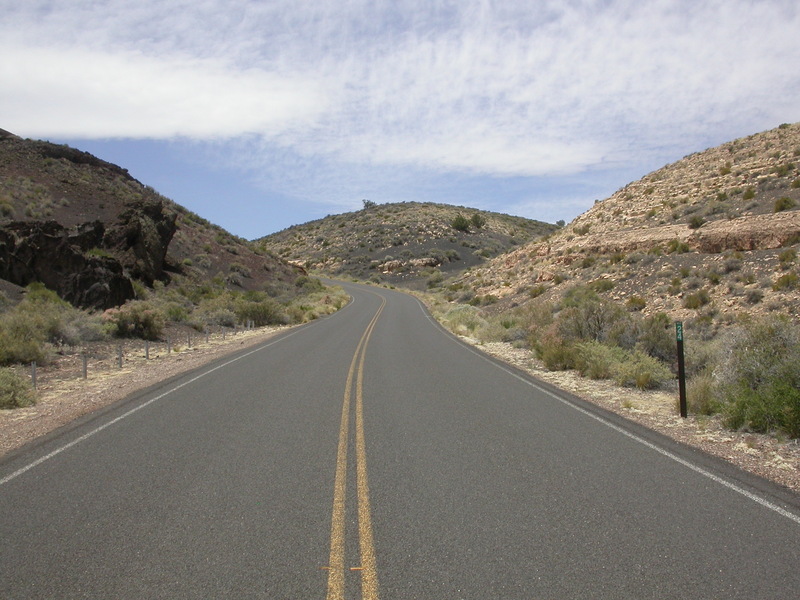 The photo at the top is from our Arizona vacation in May, on the Sunset Crater/Wupatki Ruins loop road. That’s 300-million-year-old limestone on the right and probably 300-year-old basalt on the left. In fact, the likelihood of this road being destroyed by a future lava flow is pretty good. I’m still a fan. 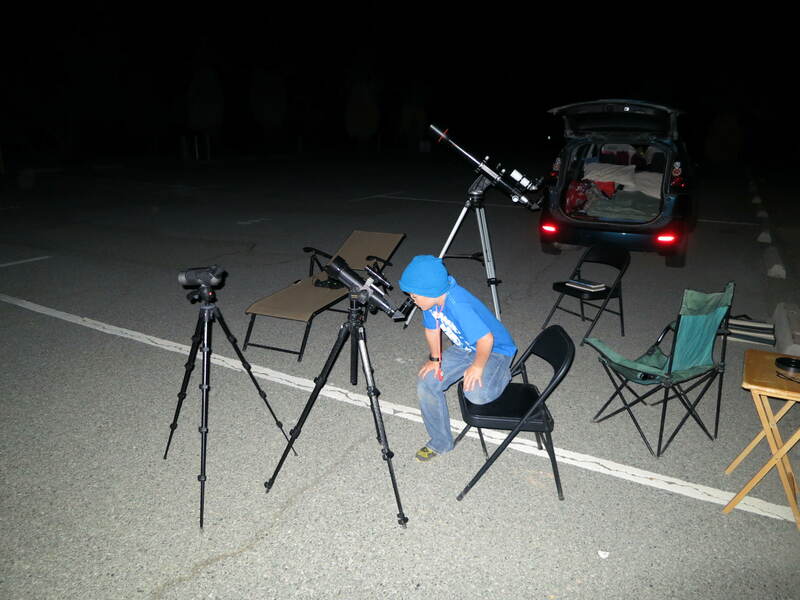 You are currently browsing the 10 Minute Astronomy blog archives for October, 2013.